Nadal Shows Why He's The Favorite At The Australian Open : The Two-Way The first grand slam tournament of the tennis year is into its second week in Melbourne, Australia, and world No. 1 Rafael Nadal is hurtling toward what would be his fourth major title in a row. Rafael Nadal of Spain returns against Marin Cilic of Croatia during their match on Monday. Nadal won 6-2, 6-4, 6-3, sending him on to the quarterfinals. The first grand slam tournament of the tennis year is into its second week in Melbourne, Australia, and world No. 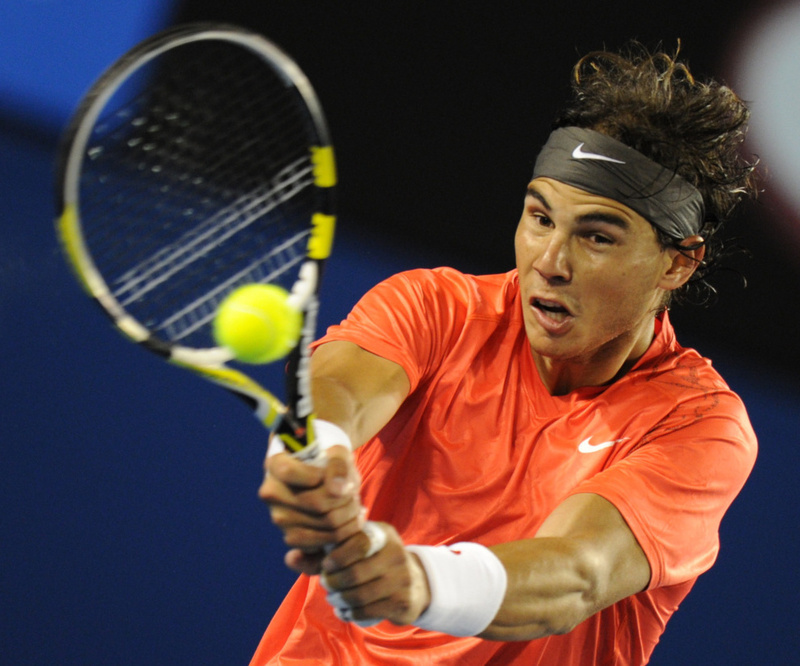 1 Rafael Nadal is hurtling toward what would be his fourth major title in a row. The Spaniard won the French Open, Wimbledon and the U.S. Open in 2010. If he wins the Australian Open this coming weekend, he will hold all four major tennis titles at the same time. No one has done that since Rod Laver won all four during the calendar year of 1969. Before making history, though, Nadal has to win three more matches, including a potential match-up in the finals agains Switzerland's Roger Federer, the world No. 2 and the man who has won the most grand-slam tournaments in the history of the game. On the women's side, Kim Clijsters is looking like a favorite despite her No. 3 seed and world ranking. Clijsters came back to tennis in 2009 after taking a break to start a family and has won two majors since then. Play in Australia is scheduled to resume at 7 p.m. ET tonight, which is Tuesday morning in Australia.